How does a heuristic evaluation improve conversion? A heuristic evaluation is an expert based analysis that applies experience-based techniques to identify and discover solutions to problems with a user experience. It is a structured approach to assessing an existing user design and though it offers no guarantees about being right, it is an important initial step in a systematic approach to conversion rate optimisation. A heuristic evaluation is best undertaken as a group of 3 or more experts and if possible some customers to allow for an open discussion and detailed analysis. The more experience you have with online experiments the better as they provide real evidence to support your heuristic evaluation. As optimisation is a data-informed process it is important to always look for evidence to support and refute any hypothesis generated by a heuristic evaluation. Why should you use heuristic evaluation? As we become more familiar with our websites or apps we become more comfortable with the user experience and often can’t see even obvious problems with aspects of the design. We also tend to become defensive when we receive criticism and less innovative. A heuristic evaluation allows you to challenge this status quo with a structured framework and experts who have a fresh perspective of the user experience. Recruiting customers for the evaluation team ensures user feedback is also included in the review process. 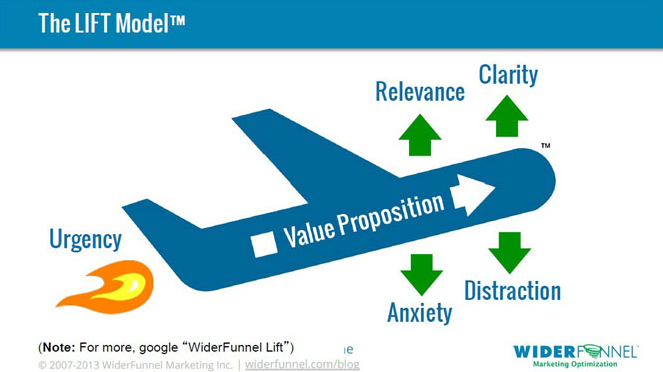 At Conversion Uplift we base our analysis on the Widerfunnel Lift Model because this provides an excellent framework to review a digital user experience. The model highlights the importance of the value proposition which reminds us that you are going to be handicapped if you have a weak or inferior product/service. So, if your product/service is deficient in some way make sure you fix that first before trying to optimise your user experience. Sometimes people think that they can use persuasive techniques to convince visitors to purchase a poor product or service. That’s not a sustainable strategy in the long-run as you won’t build up a loyal customer base. Also define your target audience before you begin the process. It is important you have a good understanding of the goals and possible use cases of your customers or prospects. If you have developed buyer personas these are useful when considering such factors as relevancy, anxiety and segmentation. Why should users come to your site rather than a competitor’s? What’s unique about your brand? What tangible features does your brand communicate? What incentives and offers are there to attract new customers? As an addition to the model we have added psychological goals. These are those implicit motivations, such as belonging, power and self-development that drive our attention and behaviour. 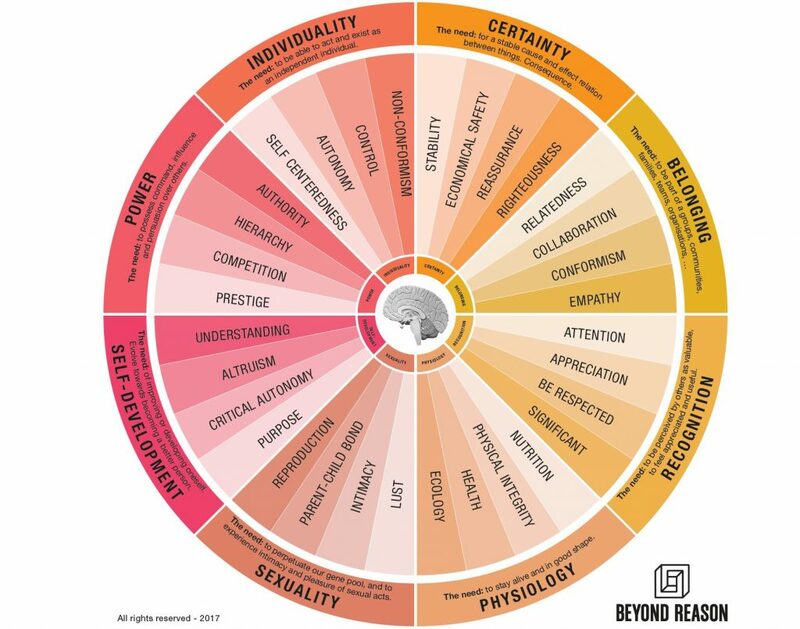 We use the Beyond Reason implicit goal model which is based upon the latest research from the fields of psychology and neuroscience. Try and identify important psychological motivations by listening to how users feel about your product or service or by conducting market research (see implicit association test). Next consider what evidence you have on your site to demonstrate intangible benefits such as credibility (e.g. professional reviews & awards) and social proof (e.g. 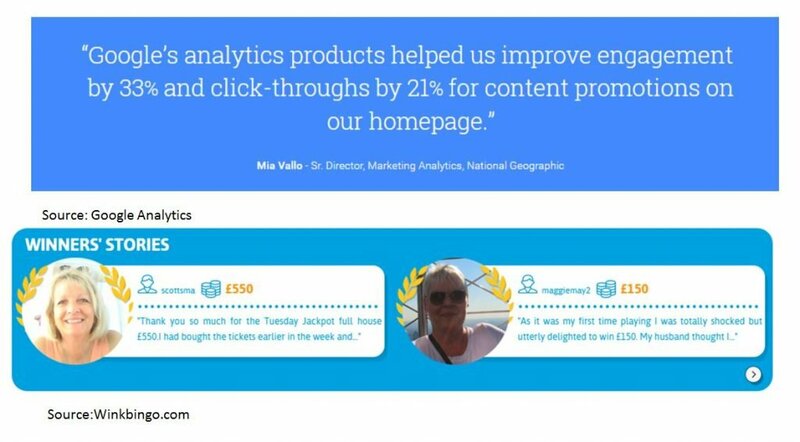 testimonials and customer ratings). These can be powerful drivers of behaviour, especially if your user’s decision style is characterised by copying experts or their peers (see Decision Styles). You should also review how your tangible costs are communicated and consider how you use packages as anchors (e.g. whether you show the most expensive first). Do you use exclusive pricing, are delivery costs clearly visible and could you use the power of ‘free’ to improve how costs are communicated? Targeting – Direct ads to most relevant landing page. Dynamic customisation – Insert dynamic headlines or text snippets to improve the scent trail. Standardization – Aggregate target segments into larger, similar groups to allow testing the overall value proposition. Target audience relevance – Does the message meet prospects needs and expectations and does it appeal to them? Segmentation – Are you using customer value or behavioural targeting? Call-to-action relevance – Are visitors ready to buy/register – what allowance is there if they are not – is relevant information available? Tone relevance – Users respond differently to words, images and design according to their demographic characteristics. Navigation relevance – Is it intuitive and can visitors find what they are looking for? Competitor relevance – How does competitor’s value proposition and messages influence your conversion rate? Information hierarchy – How well is content organised on the page and via navigation? Page-level hierarchy – Does eye-flow and content hierarchy aid decision making? Are all key messages above the fold? Design clarity – Does it reinforce the value proposition, facilitate communication, promote content, legibility and readability? Eye-flow clarity – Does it guide visitor’s eye or block its flow? Image and colour clarity – What do they communicate? Visual consistency – Are you following major web conventions? Call-to-action clarity – Do you lose early and often? Copy writing clarity – Have you tested headlines and support claims with evidence? A lack of evidence can lead to friction in the user journey. Privacy – Do you keep information requests to a minimum, justify the information you request and reassure visitors of your trustworthiness? Forms – Have you moved optional fields to a thank you page? Usability – Allow for user mistakes & errors? Error handling – Serve error messages adjacent to field & provide prompt feedback? CAPTCHA – Use software to prevent bots rather than CAPTCHA? Browser compatibility – Test on all major browsers & operating systems? Technical problems – Check & solve technical glitches as these lead to a loss of credibility? Page not found – Minimise 404 errors and display user friendly 404? Effort anxiety – Are offers easy to redeem/use? Fulfilment anxiety – Do your messages reassure users? Security – Do you display familiar security seals when appropriate? Fine print – Legal asterisk losses credibility & small print can ring alarm bells. Brand reputation – Do you display third-party credibility indicators to reduce anxiety? Delivery promise – Do you set clear expectations & clear fulfilment promise? Guarantees & returns – Do you offer guarantees (e.g. money back) to reduce fulfilment anxiety? Find the most common user screen size – Do you design pages based upon user’s monitor size and not your designer’s screen? Background – Do you use background textures, asymmetrical designs and complex graphics in backgrounds? Where now – Is the starting point of the user’s journey obvious? 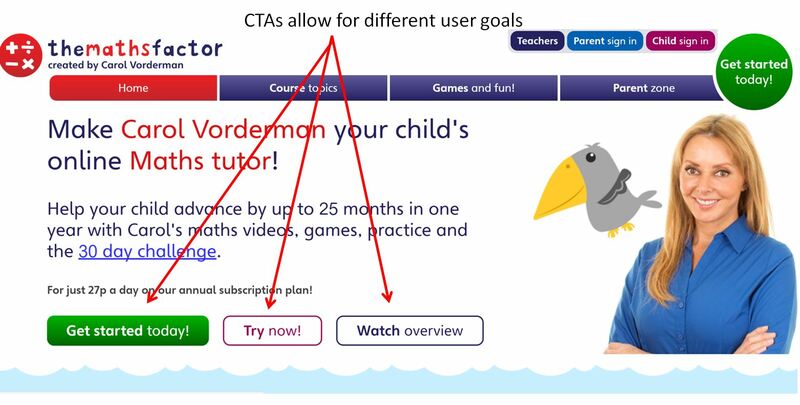 CTAs – Does the design create a focused eye flow towards a single, prominent CTA? Messages – Does your design focus on a single, clear message to minimise mental processing? Irrelevant content – Do you have ads or existing customer content that is irrelevant to some users? Navigation bars – Have you removed unnecessary navigation on landing pages or is your navigation sticky? This is about considering if there is anything that will help motivate users to make an immediate decision. There are two types of urgency, internal and external urgency. Internal urgency is dependent upon how the user feels and their needs or situation. This is more difficult to influence, but we should make allowance for it if we can. Amazon for example uses the “Buy Now” CTA to allow users who are impatient to shorten the user journey and accept the default settings (e.g. 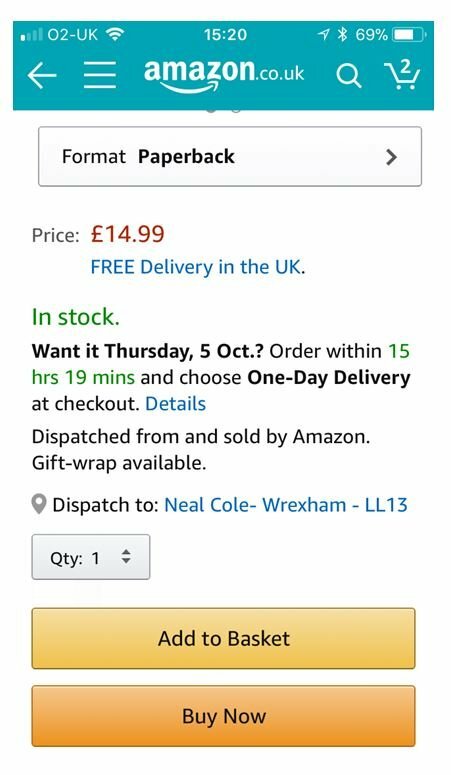 one day delivery and related charges). Create internal urgency – Use an emotional appeal using descriptive copy and evocative imagery or create an aspirational story that resonates with visitor’s desires. Scarcity – An explicit offer period creates an urgency to act, limited access offers or special editions also create scarcity. The fear of loss is also important motivator. Respond with urgency – Treat customer enquires as time sensitive. Research indicates that contacting a lead within 5 minutes has 100 times greater success rate compared to if they are contacted after 30 minutes. 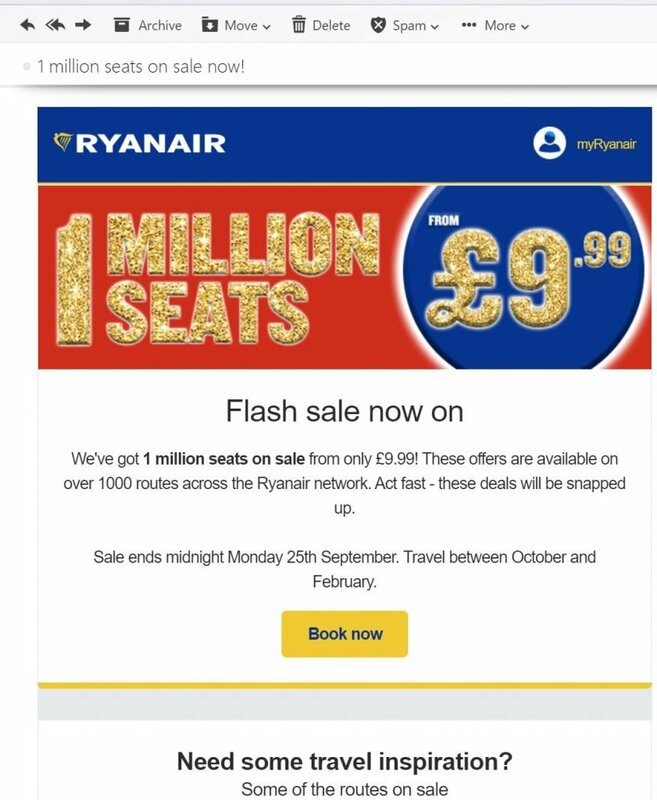 Ryanair uses scarcity with a flash sale to create urgency. The email clearly states that the sale ends on a specific date to encourage users to act now. Once you have completed your heuristic evaluation you should list out all the areas of interest (AOI) you identified for each page in a spreadsheet. There is a good chance that you will have more AOI’s than you can deal with at once. Whether this is the case or not you should go through each page and priorities the AOI’s so that you can focus on the most important aspects to improve your conversion rate. You can use the prioritisation process that I outline here to determine how you treat each AOI. The important thing here is that you present your findings and recommendations to key stakeholders to get their buy–in and agreement on your priorities. Conducting a heuristic evaluation is a valuable step in the optimisation process. It should be used to bring in experts from outside web team and if possible include customers or prospects. Using the Widerfunnel Lift Model provides a great framework and gives everyone permission to be as critical as they can be of the existing user experience. This can help challenge some of the sacred cows, such as brand guidelines, that can prevent the business moving forward. A heuristic evaluation can be especially useful when your website does not have sufficient traffic to run A/B and multivariate tests. But don’t use it in isolation. 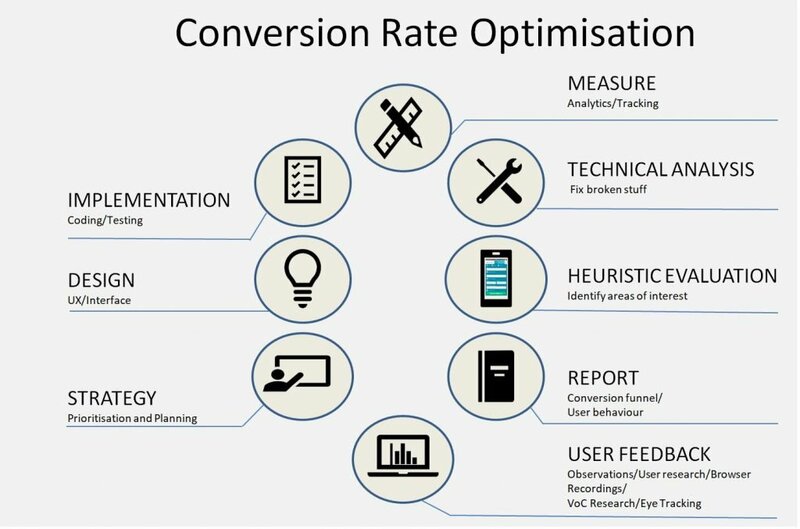 Always follow a systematic approach to optimisation as I outlined in my post on the 8 steps of conversion rate optimisation. Here is a link to a cheat sheet for your own evaluation.